Marisa and I journeyed down to Nuernberg (or Nuremberg in the wacky alternative English spelling) for the famous Christkindl Markt back in December 2009 (see previous post). At the time I really enjoyed the festival, the gluehwein, and the charming old town feel. I knew that I wanted to come back during the warmer months to tour the city properly. Last weekend I got the chance to do just that. I met up with my boy Matt Davis and his lady friend, Kim, to spend the day touring Nuernberg. Davis had previously studied about 30 minutes away in the town of Erlangen for two years, so he was very familiar with the terrain and the half-truth tour guide kind of information about the sites in town. To further legitimize the information, we met up with Davis' former language partner, Doris, who hails from a village outside of Nuernberg. We started with a nice stroll through town and ended up at the old fortress at the cities highest point. 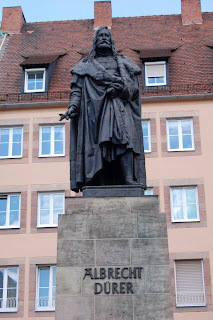 Albrecht Duerer, the famous artist/engraver, hails from Nuernberg. Davis turns the ring on the "Schoener Brunnen" (Beautiful Fountain) - it's either for good luck or for having children. They really should've cleared that up before we all gave the ring a spin. After lunch we ventured a bit outside of town to the former Nazi rally grounds and Documentation Center. 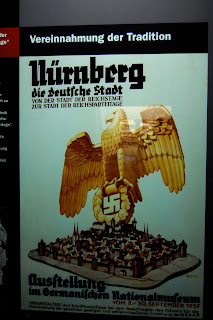 I had planned on visiting the grounds, but I wasn't ready for the thoroughness of the exhibit, covering the history of the Nazis from their rise to power until the Nuernberg Trials. It was incredibly informative...........I just wish I was mentally prepared for it. I definitely recommend a visit to this place for those that love history. The aerial view of the master plan for the Nazi Rally Grounds at the Documentation Center. The highlighted portions were either never completed or destroyed during construction by Allied bombing. You can get a view of the Congress Hall (middle left) which resembles the Roman Colosseum. The self-guided tour inside the Documentation Center walks you through the rise of the Nazi party including these pro-Nazi propaganda posters claiming "Our last hope...........Hitler." 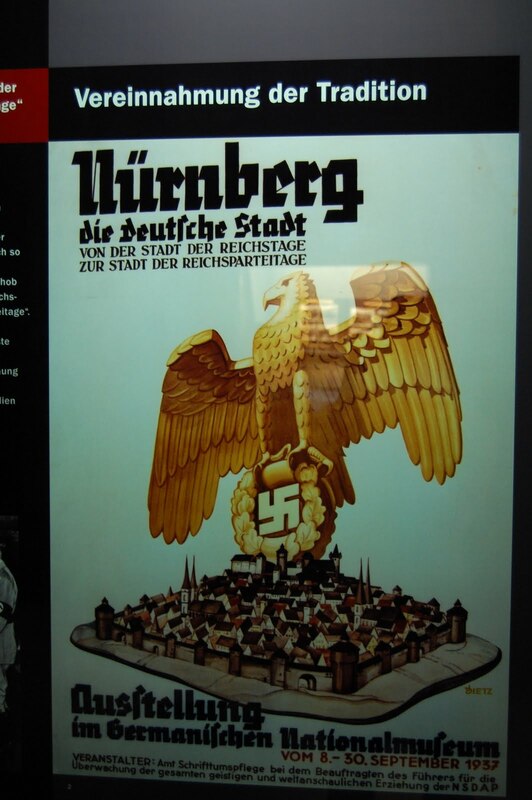 Nuernberg was to be a model city for the Third Reich, and was a popular gathering grounds for Nazi Rallies. Die Grosse Strasse (Great Street) was constructed to link a couple of major buildings on this complex. They imagined mass parades of Nazi troops marching along this street. Now it's an over-sized driveway/parking lot for the convention center. View of the Congress Hall from across the lake - you can see the Roman influence much more clearly from here. This houses the Documentation Center as well as the Nuernberg Symphony. Photo of the former Zeppelin Tribune, where Hitler would give speeches to the Nazis. Today, the very same stadium is practically useless, the parking lot is home to lots of roller-bladers and skaters, and the Zeppelin Field in the background is just soccer and baseball fields. 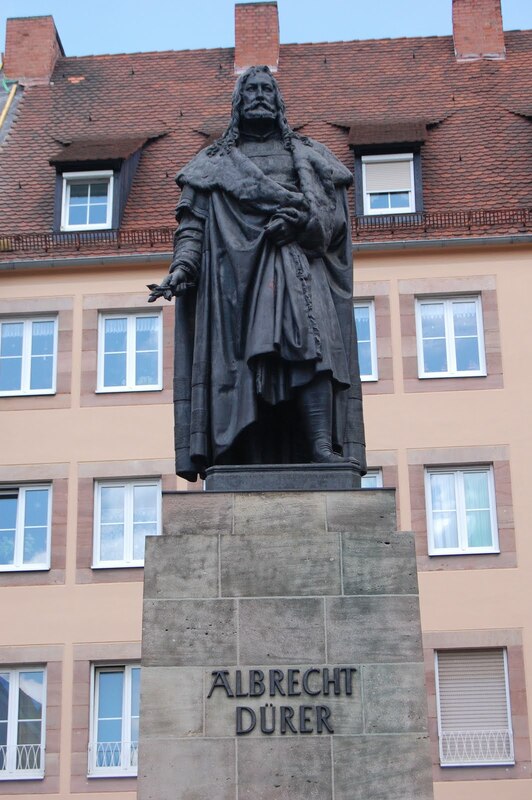 Overall it was a nice return trip to Nuernberg and it shouldn't be left off of your list of places to see in Germany.